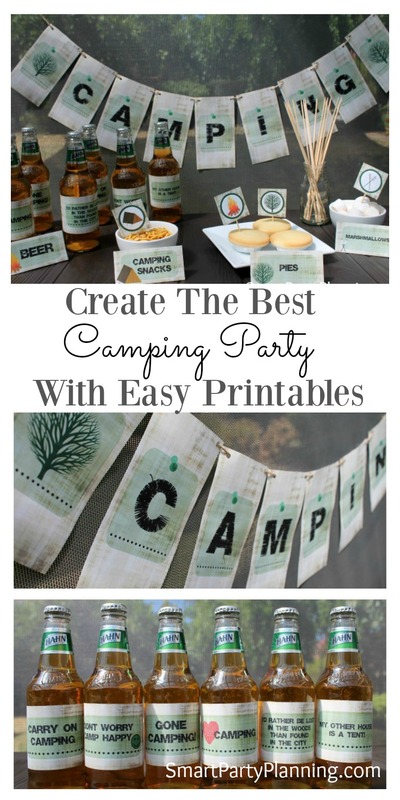 Easy to use camping party printable’s that will help bring the camp to your backyard! Complete with food tent labels, favor and cupcake tags, banner and beer labels. 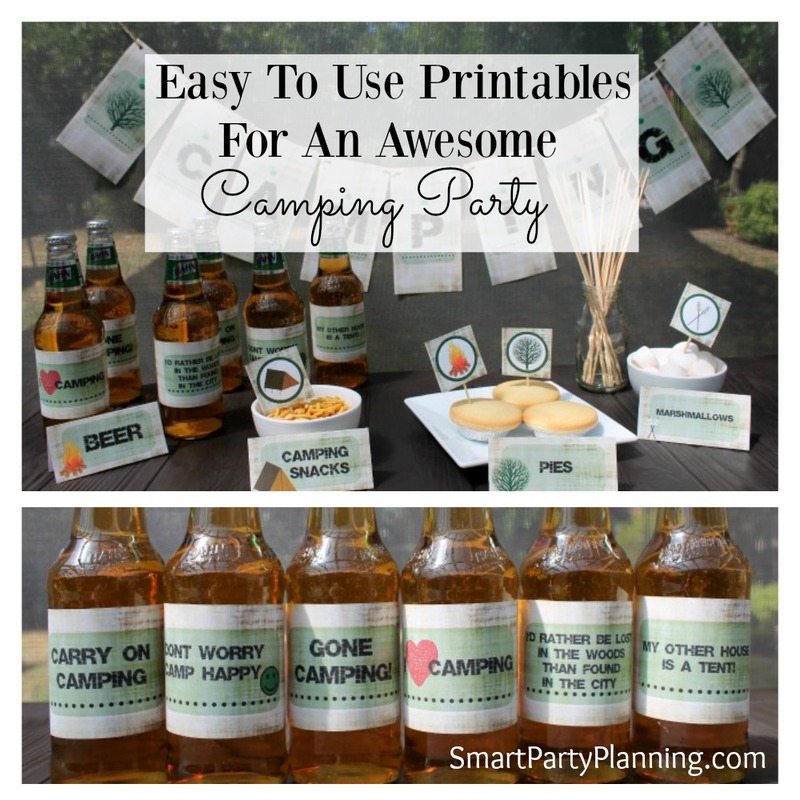 The printable’s are easy to use and help create that camping theme vibe. Kids and adults alike will love them. Don’t miss these awesome camping party ideas to help you put an amazing party together. Featuring camping party food and game ideas. Looking to make your own birthday cake? Learn how to make a campfire cake the easy way. There is something special about camping. Maybe it’s the chance to get away from it all leaving all the cares and worries at home for a few days and really getting back to nature. Maybe it’s simply nice to have the chance to sit around the campfire and stare at the stars. Whatever it is, camping has really taken off big time for a lot of families and the craze is loved by adults and kids alike. A camping party is therefore the perfect theme for anyone who loves the outdoors and getting away from it all. Camping party ideas may not initially seem to be the first choice when it comes to deciding on a theme, but it is one that is going to be loved by the adults just as much as the kids. This is the kind of party that it going to bring that breath of fresh air to your party planning. There isn’t a whole heap of camping party decoration available, so I have designed the perfect party pack for you. This camping party printable set comes complete with an A-Z banner, with each flag sized 16.5 x9 cm. Simply print as many letters as you like and you can spell out whatever you wish. Regardless of whether the party is for a birthday, father’s day or anniversary, this banner can be tailored to suit your specific needs. As with all good party packs, there are food tent labels and party tags. Each come in 4 designs with a tent, tree, camp fire and marshmallows on sticks. Mix and match as you please. A camping party just wouldn’t be complete without some beer labels (especially for the adults!). But of course, they can also be used as water bottle or soda bottle labels for the kids. The set comes complete with 6 wonderful designs which would make your guests smile. The beer labels would also make a great gift to any lover of camping. You could therefore choose to just use the beer labels and suddenly you have a wonderful personalized gift to give, and one that is a little bit different! If you were going camping for a weekend, how awesome would it be to take your beer covered in these labels. It would certainly bring some extra discussion around the camp fire! So now all you need to do is set up that campfire, make the cake, and relax. Sounds like the perfect party doesn’t it!